Jennifer Goodwin and Melissa Treuman, who hold senior executive positions, at Bideawee, a 113 year old pet adoption agencies with locations in Wantagh, Westhampton and Manhattan join Enterprise Radio. What is estate planning for pet owners? And why is this trending? Why are estate planning experts suggesting that pet owners prepare for the possibility that their animal companions may outlive them? Can you explain the Loving Legacy program and how it is so unique? How does a lack of planning effect pet shelters? 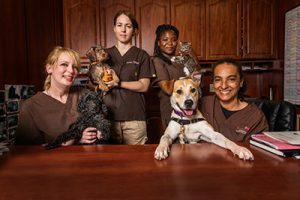 For more than 113 years, Bideawee has been the leading pet welfare organization serving metropolitan New York and Long Island. Through a vast array of services Bideawee cultivates and supports the life-long relationships between pets and the people who love them. Loving Legacy is a service offered to pet parents for a fee – this has become very popular – so if you own a cat or dog you want to make sure that this animal is cared for after your death, Bideawee will track the life of a pet and make sure it is placed in a good home.